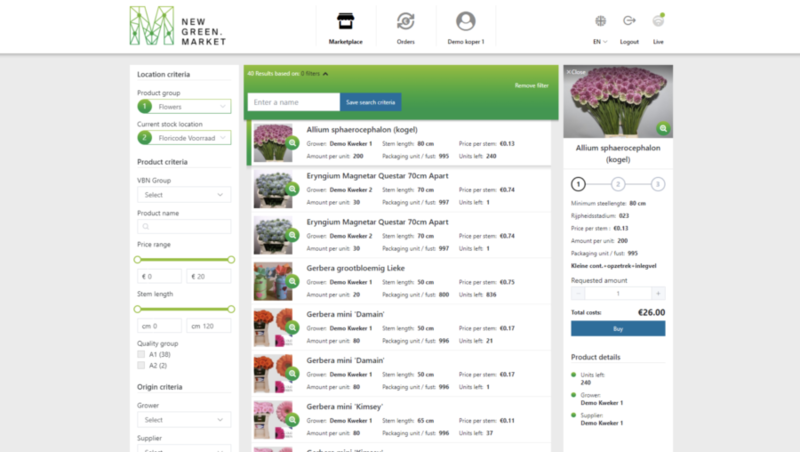 It is about to become even easier and more accessible to trade at New Green Market. NGM will be introducing a sharply improved look and feel, and new filter functions. Together with our customers, we are developing our platform and in doing so, this provides added value for everyone. Many of the green marketplaces that are currently being developed will, for instance, only deal with supply. This excludes the presence of buyers and there will be no logistics offered. It is precisely those aspects that make NGM unique. improved filter functions make it easier to make a selection – faster. The products on offer come directly from the system of the grower or seller. They are offered in real time and are always available. All sales are concluded directly at the source, enabling maximum freshness and sustainability. 24/7 trade is already taking place on NGM. With a growing number of new suppliers and product variation, the range is always changing. The product overviews have been adjusted to make them easy to consult. Thanks to these changes, you will immediately see all relevant information about a product in a logical order after clicking on a supply line. This makes it even easier to make green purchases – faster. We have also implemented an update to our logistics service, and are currently running a successful logistics pilot with a number of growers and carriers. The first orders in the test phase have been delivered successfully. If you would like to see our new release for yourself, please contact us.